Bay Area Sprawl Has Put Homes in the Path of Fires -- What Now? October's historic fires in the North Bay are a stark reminder of a growing reality across California: during fire season, millions of people live in harm's way. That number is only expected to increase as the population grows. Many Bay Area cities are trying to halt the pattern of sprawl that has put so many homes on hillsides and in the path of fires. “Certainly, it’s an opportunity for reflection and it is a moment where we can think about doing things a little bit differently,” says Teri Shore of the non-profit Greenbelt Alliance. Shore works on land use policy, but was also one of the evacuees who fled their homes as fires roared across the Sonoma County for days on end. “What became the Nuns Fire got within two miles of our home,” she says. Her home was spared. Now, she’s focusing on how her community will rebuild. Even before the fires, housing was in short supply with high prices and low vacancy rates. Now, thousands of people will also need to rebuild. 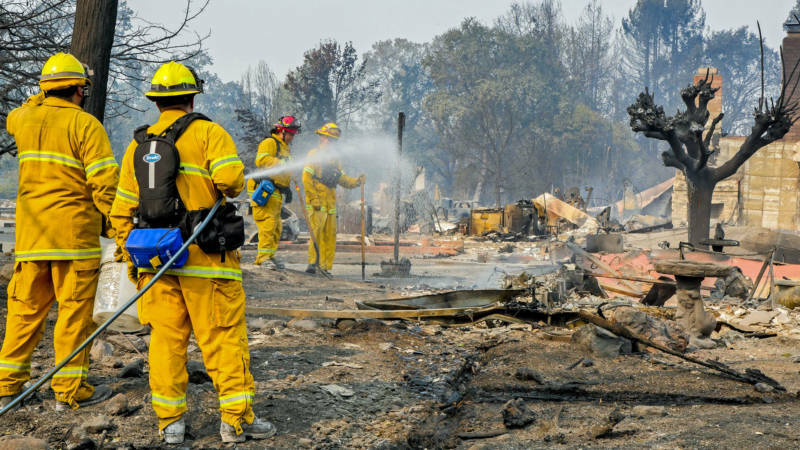 In Santa Rosa, fires razed fully five percent of the city's housing stock. Historically, cities expanded their boundaries as they grew. “People wanted single family homes and were willing to drive for hours to have that American dream of the white picket fence and the home,” Shore says. 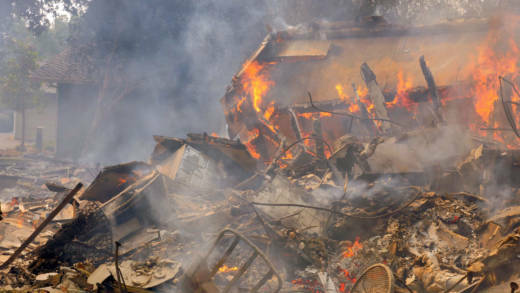 Those choices, made over decades, have put many Bay Area residents in the fire zone. “Clearly, a lot of people are in dangerous areas,” says Jon Keeley, a research ecologist with the U.S. Geological Survey. About a third of Californians live in the WUI, or the “wildland-urban interface,” as scientists call it. Studies show that could increase by a million more homes by 2050. It’s an area prone to fires whether or not people live there, because many of the ecosystems evolved with fires. But for city and county governments, that often comes at the end of a much longer list of priorities. The Bay Area is expected to add more than 2 million people by 2040. And Keeley says where the housing is built will matter. Instead of sprawling outward, there are ways to reduce the fire risk. “One is to take existing development areas and fill in those areas within the developments,” he says. Keeley is describing “infill development,” where housing is packed into the urban core, close to shops and public transit. The trend is currently on display in downtown San Jose. Like a lot of cities, San Jose looks a bit like a doughnut: growing on the edges but not a lot going on in the middle. “We’ve got a lot of work now to revitalize that middle,” Liccardo says. Google is currently negotiating with the city to build a tech campus downtown, which would bring thousands of jobs. San Jose is trying to fast-track housing development nearby, but it’s not as simple as it sounds. Infill is often more expensive to build; permitting and zoning can be more complex. San Jose has changed downtown zoning to make it easier there. But many developers are still pursuing suburban subdivisions, like a 900-home development planned for the Evergreen foothills of San Jose. City voters could see a measure to approve it on the ballot next year. In the Bay Area, the hills are often where the wildfire risk is highest. “The North Bay fires are illustrative of the perils of hillside development, certainly,” Liccardo says. In Sonoma County, many cities have instituted “urban growth boundaries,” which rein in the expansion of development outward. But the challenge has been figuring out where to build housing within city boundaries. Denser development often faces local opposition. Shore of the Greenbelt Alliance says the region has a new opportunity for infill close to the public transit system, the SMART train, which just started running a few months ago. Regional planning agencies are trying to encourage denser development through Plan Bay Area, their transportation and land use plan. Under that, the Metropolitan Transportation Commission has restricted some funding for transportation projects, giving it only to cities doing infill development. The commission is seeking to link even more funding to those goals set by SB 375, a state law that requires regions to cut greenhouse gas emissions by reducing the number of miles driven by cars. But many agree, the region has a long way to go to break the pattern that has put so many people in the path of wildfires.